USTR further proposes a new chapter devoted to textile and apparel in NAFTA in line with more recent agreements negotiated by the U.S.. The current NAFTA does not include a textile chapter. Eliminating TPLs would not move production back to the U.S. but would instead further incentivize sourcing from outside the NAFTA region and put textile and apparel factories in the region out of business. For example, some apparel factories remain production in the NAFTA region largely because TPL allows them to use third-party textile inputs and the finished goods can still be treated as NAFTA originating. The TPL mechanism has played a critical role in facilitating the textile and apparel (T&A) trade and production collaboration between the United States and Canada, in particular, the export of Canada’s wool suits to the United States and the U.S. cotton or man-made fiber apparel to Canada. Statistics from the Office of Textiles and Apparel (OTEXA) show that in 2016 more than 70% of the value of Canada’s apparel exports to the United States under NAFTA utilized the TPL provision, including almost all wool apparel products. Over the same period, the TPL fulfillment rate for U.S. cotton or man-made fiber apparel exports to Canada reached 100%, suggesting a high utilization of the TPL mechanism by U.S. apparel firms too (Global Affairs Canada, 2017). Several studies argue that without the TPL mechanism, the U.S.-Canada bilateral T&A trade volume could be in much smaller scale (USITC, 2016). 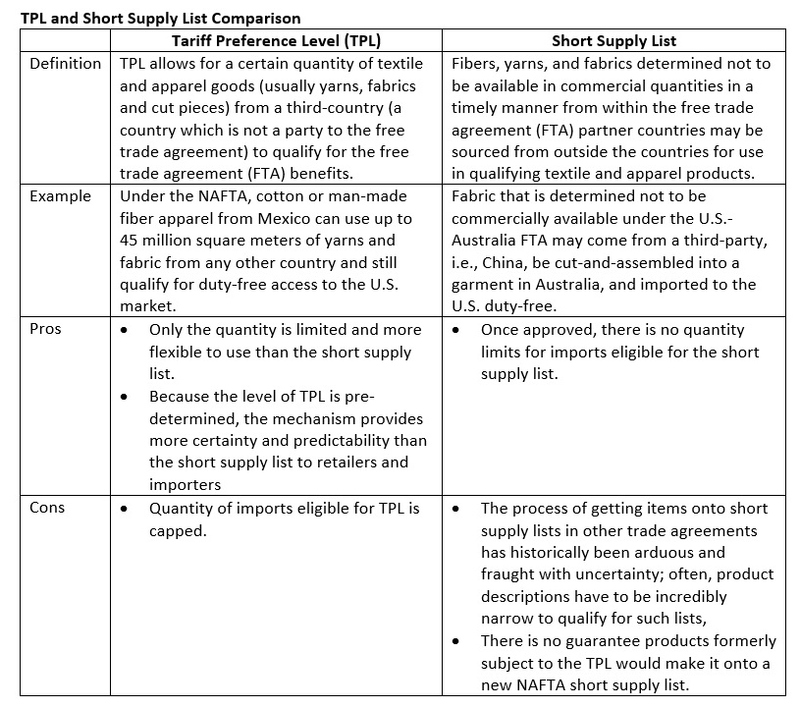 Notably, garments assembled in the United States and Canada often contained non-NAFTA originating textile inputs, which failed them to meet the “yarn-forward” rules of origin typically required for the preferential duty treatment under NAFTA. This is a very good point! I doubt SME fully understand the rule–maybe they just pick up the easy one (for example, just follow the “yarn-forward” ROO) or simply give up using NAFTA… I am working on an academic paper analyzing why has the utilization of US FTAs been declining. The complexity of rules could be a contributing factor. I think eliminating TPLs would be interesting because it wouldn’t help move production back to the US, but incentivize sourcing from outside the NAFTA region. I think that sourcing from outside NAFTA would help other developing countries grow their economy, but it could be very detrimental for the NAFTA region. I don’t understand why they are working to eliminate TPLs when I thought the whole reason people are trying to eliminate NAFTA is to bring jobs back to America. Reworking the TPLs may help bring some jobs back to America, but I don’t think it would make that big of a difference. I think the potential compromise involving a reduction in Canadian and Mexican TPLs could be a very good thing for NAFTA countries and the US, because it could benefit both parties. I think renegotiating NAFTA is a better idea than completely eliminating it. As mentioned in class, there are many advantages and disadvantages regarding the choice to invest in Vietnam as a sourcing destination. Since the country’s supply chain is still developing, particularly in terms of how 88% of their textiles and fabrics must to be imported into the country for their manufacturing process of apparel, it will be interesting to see how the possible elimination of TPLs in the NAFTA renegotiation will affect the goods produced from third world countries such as Vietnam, who in the past would have been able to provide the NAFTA member countries with necessary apparel goods while enjoying the benefit of duty-free trade. How much of an impact do developing countries such as Vietnam engage in supplying these member countries with these products, and could this affect their position in the Flying Geese Model in the future? Next Next post: “Made in America”: A New Reality?